This week at Dubspot, we are excited to announce the Why Push? contest with the chance for one lucky person to win a brand new Ableton Push! Along with the contest, we are proud to kick off Weekend DJ/Producer Tutorial Roundup! WHY PUSH? 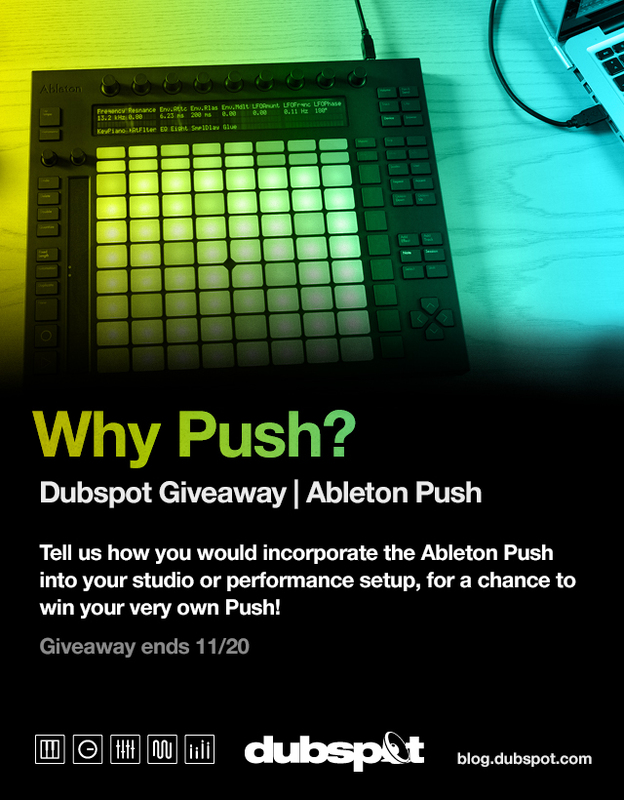 WIN FREE ABLETON PUSH FROM DUBSPOT! CONTEST ENTRY IS NOW CLOSED. The winner will be announced on our blog on November 27th, 2013, and will be contacted by email to claim the prize. In the very first installment of our Weekly DJ/Producer Tutorial Roundup, we have compiled the last three Ableton Push performance and production video tutorials to coincide with the WHY PUSH? contest. First up, we’ve got a two-part tutorial from Dubspot instructor and Ableton Certified Trainer Dan Freeman, in which he demonstrates how to build a track from scratch without any pre-recorded audio using Ableton Push in a live performance setting. In part two, Dan Freeman breaks down the performance and offers tips for composing in real time with Push! Then, Adriano Clemente (Capcom) showcases more live performance techniques using Push! The purpose of Push is to take digital production back to the physical realm, so producers can spend more time with their hands on an instrument instead of a keyboard and mouse. When I got Push, I thought it might be the right instrument for something I’ve wanted to do for a while–live production. Live production means starting out with no prerecorded tracks and creating a tune so quickly that it sounds like a performance. In this video, I’ve made an effort to concentrate on the major features and options that are useful when performing with Ableton Push. I don’t necessarily define Push as a performance controller, nor do I use it as the only component of my rig–it’s more of a studio buddy which helps me to transform the experience of making music into a more engaging dimension, and escape the classic keyboard-mouse setting. Class just started; sign-up today!